NWTRCC promotes tax day actions every year, collecting a list of actions around the U.S. and sending out a press release widely in early April and posting reports on our website and on our Facebook page. Look under our Media link above for “articles” and “podcasts” for recent news items. 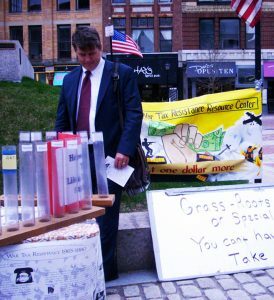 A penny poll and leafleting were held on Tax Day in downtown Portland, Maine, sponsored by the Maine WTR Resource Center. More than a dozen communities in Maine along with some college campuses hosted tables and leafleting from late March through Tax Day. The effort was coordinated by the Resource Center. Photo by Ginny Schneider. Post Your Action: Use the form below, or email the details, or send in this form (PDF), and we’ll announce actions, workshops, film showings, etc., between now and tax day on our website and in a national press release. 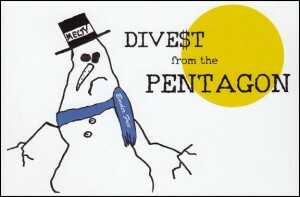 Once again NWTRCC is encouraging Collective Redirection to Black, Brown, and Indigenous Resistance as part of our ongoing Divest from War, Invest in People campaign. This effort supports organizers who are directly targeted by state-sponsored violence and are fighting for liberation in our communities. 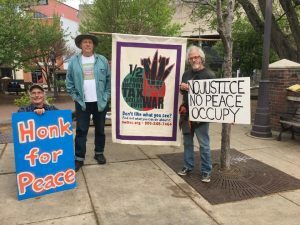 It challenges us to actively build stronger and more connected movements to take on militarism, racism, and occupation in all its forms. Not just charity, Collective Redirection is intended to build relationships and strengthen solidarity. Fill in the who/what/when/where for your tax season event or action and we'll add it to this page of listings. 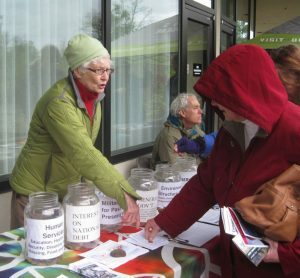 Let us know what you are doing — any time of year — and we’ll post your war tax resistance actions and events on our website.